Bowron natural sheepskin longwool oval rug. Magnificent, longwool lambskins selected from the finest New Zealand and Australian flocks are used in the manufacture of Bowron longwool area rugs. These rugs are at home in any environment: home; office; hospitality. Skilled craftspeople meticulously select and match individual pieces then stitch together to produce extravagant floor rugs; opulent luxurious softness, depth and a desirable sense of style. 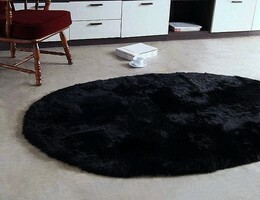 Sheepskin rugs are naturally beautiful, luxurious and comfortable; thick, soft and luxurious. Nothing compares to the luxury and durability of a sheepskin rug or it's natural comfort for the human body. Sheepskin is naturally luxurious, beautiful and comfortable. Sheepskin wool breathes and is static resistant. The structure of sheepskin wool allows the body to be supported by millions of resilient and springy wool fibers, providing total support and comfort for the body. And sheep skin wool is a great insulator. Wool traps air, which insulates you against cold and heat. Sheep skin wool is natural stain, soil and flame resistant too. One of the oldest and most natural materials known to mankind, it can enhance your comfort and improve your well-being.